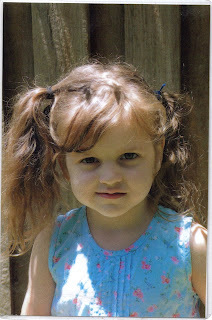 Another year has past since our precious daughter was only 4 years old when this photo was taken. This was taken when we first moved to Tea Gardens and she had started at Daycare. On the 8th April chloe was born 5 years ago with a rare genetic disorder called Incontentia Pigmentii. After initial scares and berwilderment, wondering if it had affected her mentally and physically, our prayers were answered. We are happy to say today, she is a healthy, active, happy young lady with only a few external scars on her torso, problems with only 20% vision in her left eye (we are still waiting for her new glasses to arrive after her lenses broke)and her teeth are coned shaped (like sharks teeth) which can be fixed with dental cosmetic surgery later in life, in which she is on a waiting list to have done when she is older. Though at times Chloe shows symptoms of Aspergers, we believe she is making great progress at school. I reckon we have a little budding artist on our hands as she seems to have the ability to draw and colour in with great imagination and skill. Who would have thought the first 2 years, after feeling anguish and worry that our little girl could have Neurological problems, that she has infact beat those odds, after Jordans diagnosis it was just too much. I remember Chloe just a newborn baby, after seeing a specialist, slamming the car door over and over to see if she would jump with the noise like most babies do. She didnt blink an eye. My world just crumbled once again. What did i do once again, played over and over in my head. I now know there was nothing that could of prevented this mutant gene from forming into a rare chromosone disorder that we still know little about called Incontentia Pigmentii. Chloe never goes a day without telling me how much she loves me, and even though i tell Nicolas, Jordan and Chloe everyday how much i love them, i am sending an extra special message for Chloe, our only daughter, Happy Birthday Princess and look forward to making your day a special one. We love you very very much. Happy belated birthday Chloe! She is so beautiful! love to find out more about your daughter my grand daughter was born with ip.shes five hers is much more severe but after seeing your story.I FEEL SHE CAN HAVE A NORMAL LIFE. A VERY HOPEFULL GRANDMA.